“We want to be the brave ones who see an opportunity in the future, and we believe that we are living a new time with the gospel of eternity. … All of us, without exception, experience a past, exist in a present and live in the expectation of a future. Likewise, the church also exists in this tripartite reality and this very clearly becomes imperative, because its master and Lord, according to the Holy Scriptures, has come, lived and will return. (John 1:11, 1 Corinthians 15, Mark 13:26). In these days, perhaps more than ever, we have been led to reflect on this reality, especially at this time when we established a New Anglican Province in Brazil and, along with it, the formation of the Anglican Church in Brazil. – Archbishop Miguel Uchoa, Primate of the newly formed Anglican Church in Brazil, explains how he and his Church have come to this point. Read via Google automatic translation (which is good but not perfect), or the original post in Portuguese, on his website. 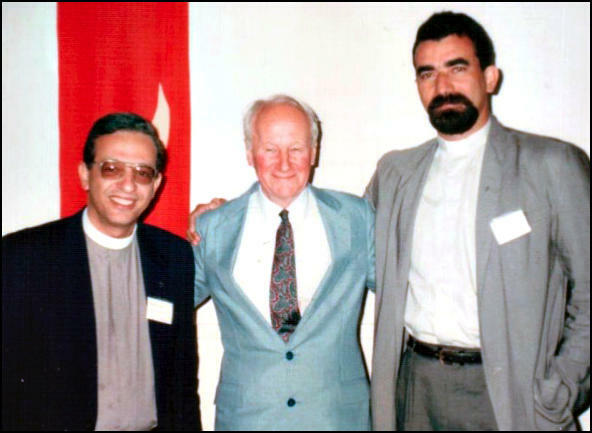 Archival photo featured on Archbishop Uchoa’s website: Miguel Uchoa (at right) with two dearly missed Christian leaders, Bishop Robinson Cavalcanti and John Stott.